Horses bring so much light and colour into our lives. Their majesty, their sense of fun, their strength, beauty, athleticism and loyalty. Sometimes a horse that we might never even meet captures our imagination. Endo, an Appaloosa gelding, is just such an animal. The most wonderful of horses, tragically ‘moon blindness’ caused him to have his eyes removed. "Moon Blindness" was named during the 1600s because people thought recurring attacks were related to phases of the moon. Despite this cruel turn of events, Endo, now 19, continues to lead a fulfilling life with owner Morgan Wagner in Eugene, Oregen, and has become an inspiration and joy for hundreds of thousands of people across the world after becoming a social media star. Among the herd, Morgan noted a horse who had a “presence” despite being just a few months old. That horse was Endo. “When he was a young horse he was very spooky nervous and hot, but he was also intelligent and loving,” Morgan told FEI.org. Endo lived a happy life, with Morgan training him with enthusiasm if little previous experience. Entirely self-taught in schooling, Morgan and Endo developed a special bond. When he was eight years old, Morgan noticed that Endo was starting to squint a lot. “His eyes seemed painful, and they were often weepy during the summer months,” she recalls. Morgan had the vet out as soon as she realised that something was wrong. 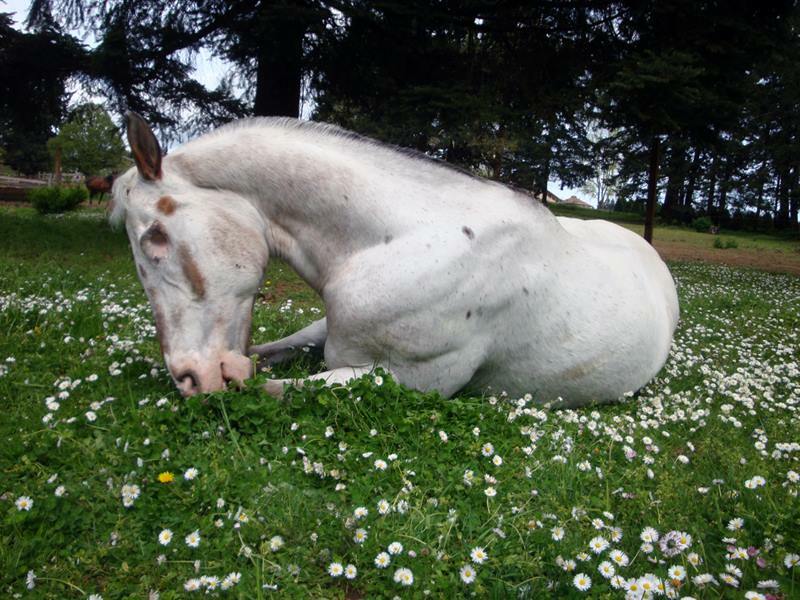 Endo was diagnosed with equine recurrent uveitis, glaucoma and cataracts. Much was done to try to alleviate the pain Endo was suffering. Morgan removed dust from his environment and began to only take him out in the dark. The vet prescribed medicines and ointments. However, Endo’s pain would not subside and his right eye ruptured. Poor Endo, clearly distressed, lost his appetite and stopped eating. After further consultation and five years after the problems began, Morgan made the decision to have Endo’s right eye removed. “Right after surgery, Endo was scared,” Morgan recalls. She found him shaking in his stall on the first night. She stayed with him to offer comfort. Unfortunately, matters did not improve with his left eye. Within months it was clear the other eye would also have to be removed, leaving Endo, now 13, totally blind. Morgan began preparing Endo for total blindness. She blindfolded him for brief periods and remained close, whispering encouragement and petting him. “At first, he shook in fear, scared to move,” she recalls. Soon she coaxed this brave horse to take his first steps without sight. Progress had been made – although the clever gelding soon figured out how to remove the blindfold! The second operation took place about six months after the first. Thanks to his own bravery and Morgan’s preparations, Endo recovered much more quickly and with more confidence than he had after his first surgery. Five years later Endo leads a happy and fulfilling life despite his disability. 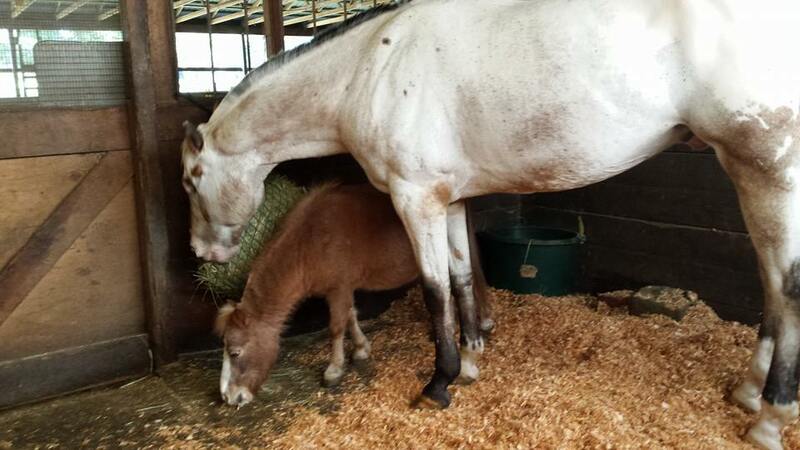 He has a miniature called Cinnamon as a companion in his stall. “Endo is able to do anything a sighted horse can do,” Morgan says. “He competes, trail rides, travels, jumps, performs liberty work, and participates in any other new experience that becomes available. “He loves attention and knows applause means 'good boy'. He’s still a hot horse despite the enucleation! “He's allowed to free roam during the day when I'm working outside. He's the mower - eating is his favourite activity! He is a huge crowd favourite at Expos, where he has demonstrated his versatility, intelligence, and trainability in a variety of venues all across the US and Canada. He has almost 200,000 followers on Facebook and 66,000 on Instagram. People love to see photos of him playing, and are amazed by videos displaying his incredible talents. Endo is truly a special horse. Make sure you follow Endo on Facebook and Instagram to keep up with his latest adventures!